This recipe requires a bit of an intro. All through my childhood years my mom baked bread. I got the best part of this tradition, because as the youngest, I was home to help her while my siblings were off at school. I had my own baby loaf pan, and helped her roll out the dough and shape it. Sometimes I made bread men who were never very good because they were mostly crust. Anyway, this wasn’t just a fun time, it was great bread. The kind that makes pbj’s worth eating (especially with raspberry freezer jam!). When mom made it on Saturdays, she always had Dad do the kneading. The funny thing was that she just sort of stopped making it when we were a little older and she was a little busier. As I recall we were also going through a poorboy phase that lasted several years. Much later, when I wanted to make it, we found a little problem. Mom had had the recipe memorized, apparently lost the hard copy and didn’t notice. But, after a long sabbatical, she no longer remembered any details. I tried to pioneer my own favorite loaf bread, but never liked anything I made as much as what I had grown up on. Eventually, I had a brilliant idea – I called my childhood friend’s mom, who had been our neighbor in that era, and asked if she had the recipe. I remembered that she made it too, but hers was all wheat and crunchier. Anyway, she did have it. It was called “Jane’s hardly ever fails bread”. I got the recipe from her, and then made it a bunch of times in a row changing things to try to find what Mom did. In the end I found out that Mom left out the eggs, used honey instead of brown sugar, and part white instead of all wheat flour. I was thrilled – the ultimate childhood bread was back in the family! The great part of all this is that now I make it with my girls, something I would vastly prefer to playing with blocks! 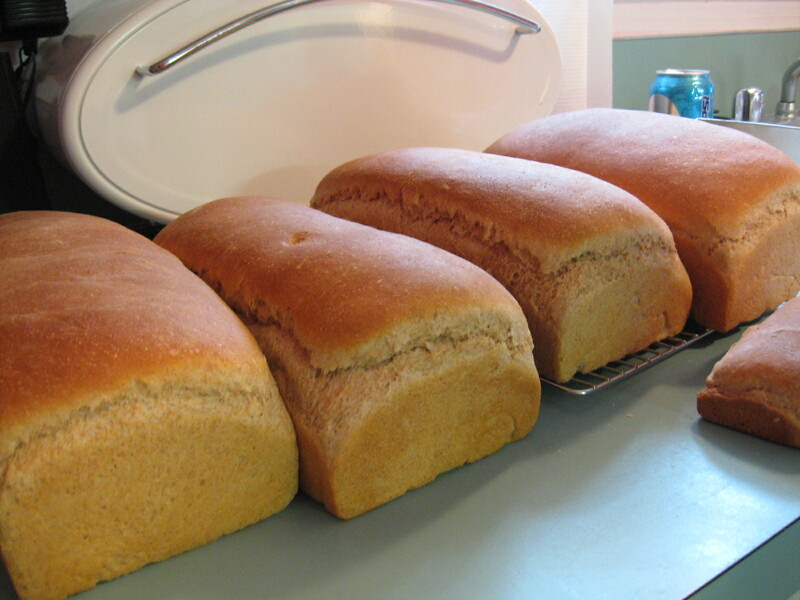 The recipe makes a lot – four large loaves, or six smaller ones. You will want to freeze the ones that you aren’t eating right away. In the bowl of your kitchen-aid (or by hand in a large bowl), mix 5 c. hot water, 2 Tbs. yeast, 2/3 c. oil, 2/3 c. honey, and 4 tsp. salt. Mix in two cups of whole wheat flour, and let the yeast proof for a minute or two. Dump in any leftover (cooked) oatmeal you might have lying around. Continue mixing (or stirring) and add another 3 c. of whole wheat flour, and 6 c. of white. When a sticky dough is formed, let your kitchen-aid work it for a few minutes, adding flour if it seems really wet. If you are doing this by hand, you will dump it out on the counter and knead it for 10 minutes, sprinkling with flour if it is too wet. Pull the dough out, and hand knead for about 15 strokes, or just enough to pull it all together into a nice dough ball. Put a little oil in the bottom of a big bowl, and smoosh the dough in it to coat the top in oil, then turn it over, cover, and let rise in a warm place until doubled (an hour?). Call your kids back into the kitchen to “punch it down” – very satisfying! Cut the dough (I use my bread knife) into either four or six pieces. Give a bit to the kid on the stool to roll out and make a baby loaf. Roll each piece out into a rectangle to work all the big air bubbles out, then roll it up tightly, and place in a greased loaf pan. Repeat with the others. Let the loaves rise while the oven preheats to 375 degrees. When they look more like bread, and less like logs, they are ready to go in the oven. Let them bake for around 25 minutes, or when the tops are dark gold and the bottoms make a hollow sound when thumped. Remove from the pan and let cool, unless you slice it on up right away to eat with butter and honey. I’ve been so tired and so busy lately that I’ve just let bread baking slip. My family misses it so much. Thank you for the inspiration! I like my bread recipe but I think I will definitely try yours and your mom’s. Thank you for reminding me how much this means to the kids! I was a little embarrassed after I posted it to see that the baby in the pink blanket in the background is Titus, not Chloe. Ah, the costs of having a twin sister! What size loaf pan for the large loaves? Thanks! I’d love to try this recipe! I just have one question. Could you give a closer estimate of the oatmeal amount? Even a ballpark figure? Thanks! Lori – it really is however much you have leftover (although I wouldn’t go above 2 c.) You may have to use more flour to compensate, but that’s o.k. I never really measure the flour after the wheat anyways, you can just go by how the dough looks. Your post brought back good memories. I used to have my little ones help as well when I made bread. They’d get in on the end of the kneading stage – turning and “spanking” the dough. They thought it was great! Love that last picture! And I love the idea of having a little pan for my girl (and someday girls) to make their own loaf. I must do that! I love this recipe. I found it in the Hot Providence Cookbook and have been making it ever since. I hardly buy bread anymore. How could I? This stuff is the best! A friend of mine told me about the cookbook and it has become one of my favorites…thanks for sharing! Our family has definitely benefited. I have your mom’s bread recipe … you should have just asked me — it would have made your task simpler, but I guess not quite such an adventure. I’m so happy to hear how much you are enjoying your life in so many different ways — you are indeed blessed!! I genuinely love kneading bread, but dislike how it gums up my rings. Do you have any suggestions besides simply removing the rings prior to kneading? It is encouraging me so much in my homemaking and wifey skills to share recipes & comments with other women. So thanks for being blessings. That is too funny that you had the recipe this whole time! I am going to shift the blame and say that Mom is the one who should have known – I was too little to know who she was sharing recipes with! Thanks for the sweet comment! Oh, by the way.. I ended up buying the bear house pattern online, so I don’t need to borrow it. Keep an eye on the craft blog to see if I get it done! And Melissa – If you really won’t take them off, and really won’t just let them get gummy (which I do) try spraying your rings with non stick spray before kneading. While I think that Wusthof knives may be the answer to all problems in the kitchen, you should use a quick back and forth stroke, not downward pressure. Glad the recipe worked for you, and glad about your “wifey skills” too! So I want to know how well the recipe Aunt Monica has matches Rachel’s recreation! I love the picture of your little girl ( and her hair cut, oh, so cute!) it reminds me so much of when I was little helping my mom in the kitchen making peach pies in my mini pie pan. And the glorious delight of scooping cloudy mounds of meringue atop a lemon pie ( we used to make them for Mrs. Millers father who was our pastor in AZ) It really is so much more fun than playing with blocks! I made this delicious bread a couple of weeks ago – using the Christ Church cookbook–again! What I especially liked about this recipe was that I was able to give away 2 of the loaves, yet still have 2 for the 9 of us! 🙂 Thanks for sharing the recipe! Okay, I know this post is pretty old, but I have a question about the whole wheat flour. Is it of the store-bought variety or fresh ground? At first I assumed it was store bought, (don’t know why, really) and while the loaves were yummy and rose beautifully, the loaves were very heavy and dense. Anyway, I guess I was hoping to find out if I just missed something or if everyone else had the common sense to assume differently and correctly. 🙂 Thanks! I love this bread recipe. It is my favorite! Question: What size kitchen aid do you use? Because I have the 5 qt and can barely fit 1/2 recipe in it. Would love to be able to make a full recipe!